Thirsting for adventure but you aren’t equipped with a vehicle that has the power and versatility to take you where you need to go? With the 2019 BMW X4 working under your feet and at your fingertips, you have the capacity and the means to go where the next journey takes you. Mississauga drivers far and wide can test drive this dynamic vehicle in the latest BMW lineup at Pfaff BMW. Please read on to learn more about this capable car. 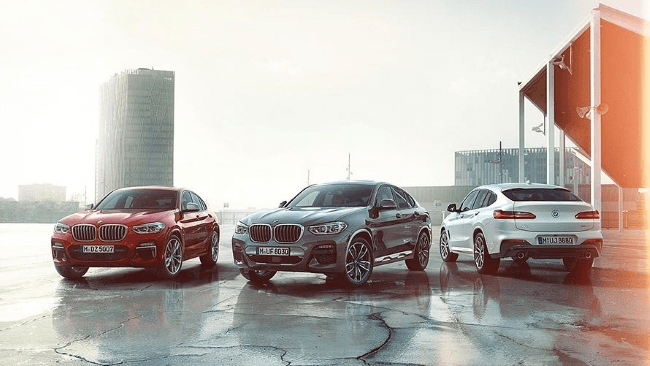 Firm sports steering and adaptive M suspension unite in the robust body of the noteworthy 2019 BMW X4 models. Thanks to its exceptionally low centre of gravity, and variable sports steering, agility and precision are increased, ensuring that less physical effort is required to turn the wheel during dynamic driving, while the reduced lateral inclination of the body provides high stability. It is thanks to the adaptive M suspension that this competent car has the skill and reliability to traverse any road that comes your way. The suspension can be electronically adjusted at any time to suit the current road and driving conditions, creating versatile handling capabilities. The driver has complete control, as they can also adjust the suspension characteristics through the Driving Experience Control to enable their preferred driving style at any time. Master every road you traverse with consistent stability, maximum precision and unique handling. This year’s model of X4 houses one of the most intelligent driver assistance systems on the market, as the BMW Driving Assistant Plus offers greater security and comfort during those monotonous drives through to complex road maneuvering. Diligent in its capacity and reliable in its safety mechanisms, the system provides drivers with Lane Departure Warning, Active Cruise Control, with Stop and Go functions, and Traffic Jam Assistant. The best performance of the BMW X4 continues systematically from the road through to the World Wide Web. Utilize the assistance features while obtaining access to the innovative infotainment system that entertains and informs. With access to the BMW ConnectedDrive, enjoy optimum connectivity at all times when on the road – for relaxed and straightforward daily mobility. With extended, at home, and overnight test driving options currently available at Pfaff BMW, now is the perfect time to try out the 2019 X4 BMW! Interested drivers should stop by our Mississauga dealership, locally situated at 4505 Dixie Road, to access great deals on this year’s lineup. For more information about how you can get behind the wheel of one of our superior vehicles, please feel free to continue browsing through our website. Click here to find our contact information, to fill out our contact form for further assistance, or schedule that test drive today!